South Korea’s presidential office Cheong Wa Dae said Friday that the much anticipated trip to Seoul by North Korean leader Kim Jong-un may materialize in the near future, though it will be difficult to occur this year. Seoul has been pushing for Kim’s unprecedented trip in the hopes that it will help further improve cross-border ties and give an impetus to the ongoing diplomatic efforts to denuclearize North Korea and establish a lasting peace regime on the peninsula. During the third summit between President Moon Jae-in and Kim in Pyongyang in September, Kim agreed to visit the South to reciprocate his South Korean counterpart’s visit to the communist state. “The South and North are communicating closely through various channels, and (we believe) we need to keep watching how the situation will unfold,” a senior presidential official told reporters. “It appears to be difficult for the trip to occur within this year as there isn‘t much time left until the end of the year. However, as the Pyongyang declaration says the trip will occur in the near future, we believe that promise will be kept,” the official added. 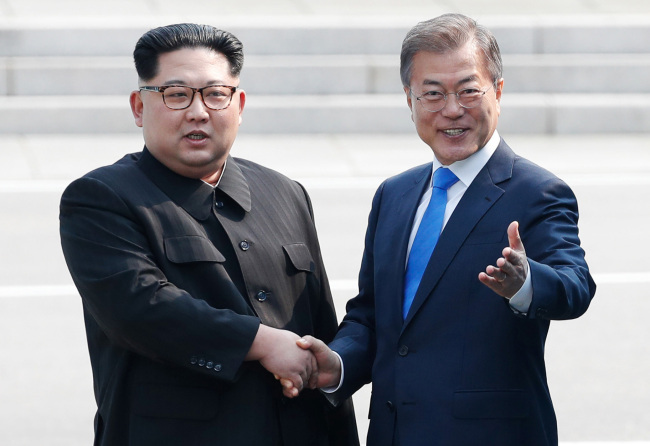 The official, in addition, said that the Seoul government will not rush or pressure the North to arrange Kim’s trip to Seoul, though there was a “verbal” agreement that Kim will travel to the South this year. Regarding the sequence of Kim’s trip to Seoul and his expected second summit with U.S. President Donald Trump, the official said that there is no stance regarding the issue. “Whatever comes first, this will help the development of inter-Korean relations and progress in negotiations between the North and the U.S. in a virtuous cycle. Thus, the sequence doesn’t matter much, and regarding this, the South and the U.S. are on the same page,” the official said.